Greg Gallagher (13) and Demitri Tzitzon (12) congratulate Jake Stelline (10) for his goal while Ipswich goalie Erik Fyrer looks away. Demitri Tzitzon nails second half penalty kick. 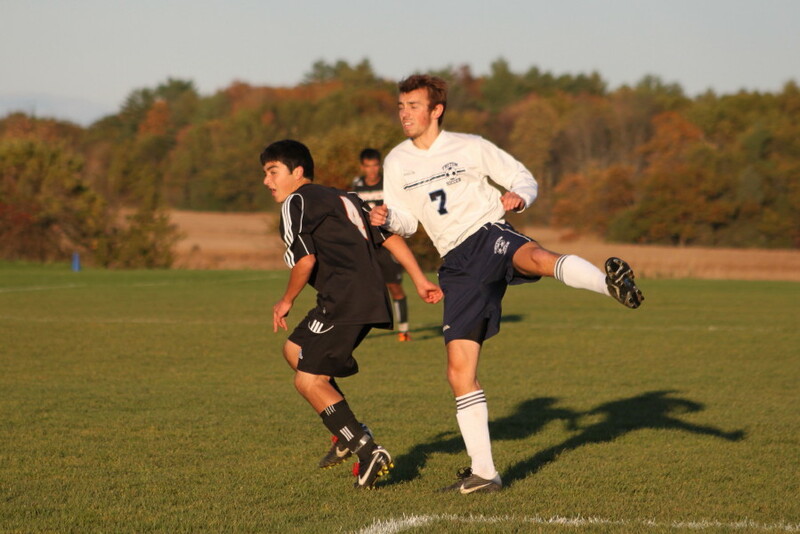 (Byfield) The Triton boys soccer team, led by Jake Stelline, defeated Ipswich, 2-0, Tuesday afternoon at sunny/windy Triton. Now both teams have four wins. And in a season in which wins are scarce, Triton (4-11-1) has to be pleased to now have won three of their last five matches. On the other hand, Ipswich is on a losing streak that has reached six. Ipswich (4-11) gave up both goals in the second half. 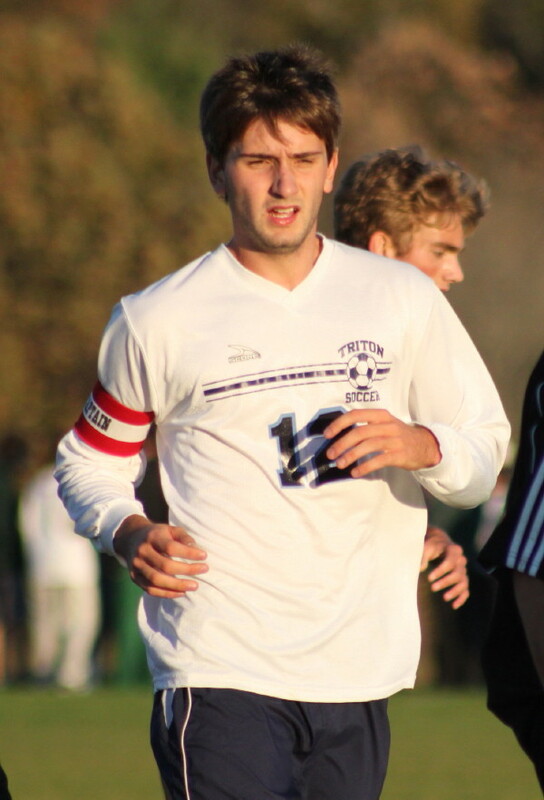 Viking senior Jake Stelline was a factor in both scores. 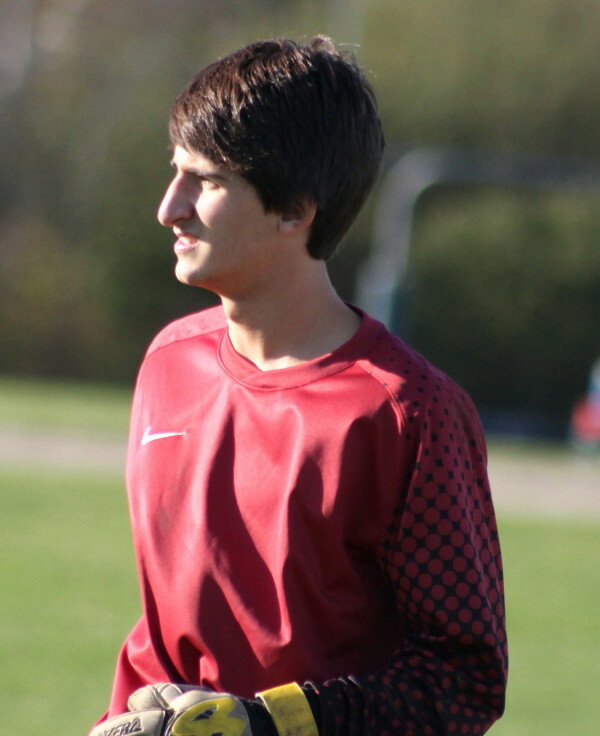 He set up the first goal by drawing a pull-down penalty (on Kyle Cantrell) that led to Demitri Tzitzon’s successful penalty kick. Later in the half, Jake beat Tiger goalie Erik Fyrer to a 50/50 ball and put a quick shot past him. I’ve been to a few outdoor events at Triton and the way the soccer field is set up makes one end a lot less appealing to defend than the other. If the wind doesn’t get you, then the sun will. And also the later in the day it is, the worse those two can be. The Ipswich captains won the toss and surprised everyone, including their coach, by choosing to put their goalie (Erik Fyrer) in the position of facing the sun/wind in the second half. Unfortunately (for Ipswich), the crosswinds of the first half changed in the second half to blow strong and straight at their goal. 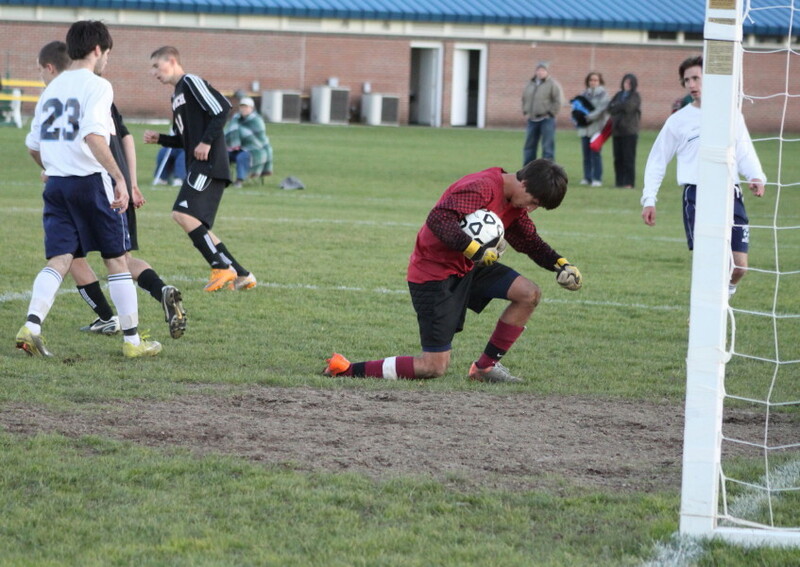 Triton goalie Dalton Tzitzon stunned by hard Ryan Law shot late in the game. The elements aside, this was an even match with both teams getting numerous scoring opportunities. 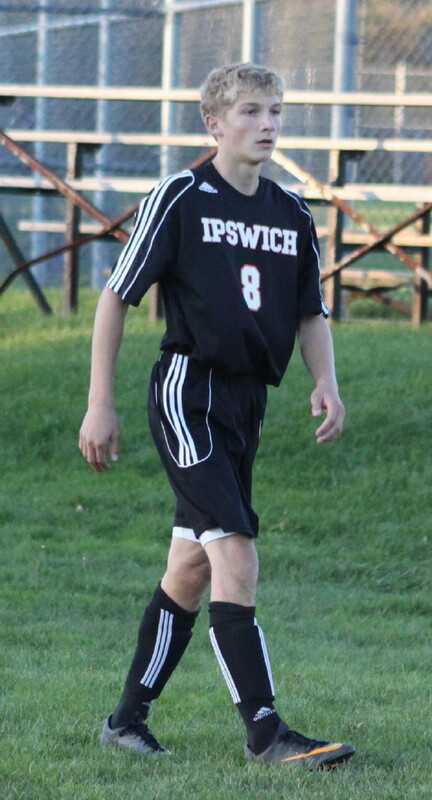 Even against the wind Ipswich had several in-close direct kicks in the second half that missed the net entirely or were kicked right at Viking goalie Dalton Tzitzon. The Tigers best shot of the day was in the last minute when Ryan Law’s blast actually spun Dalton around as he caught it. But on this day he made all the stops getting his third shutout of the season. I was down the far end for both goals. 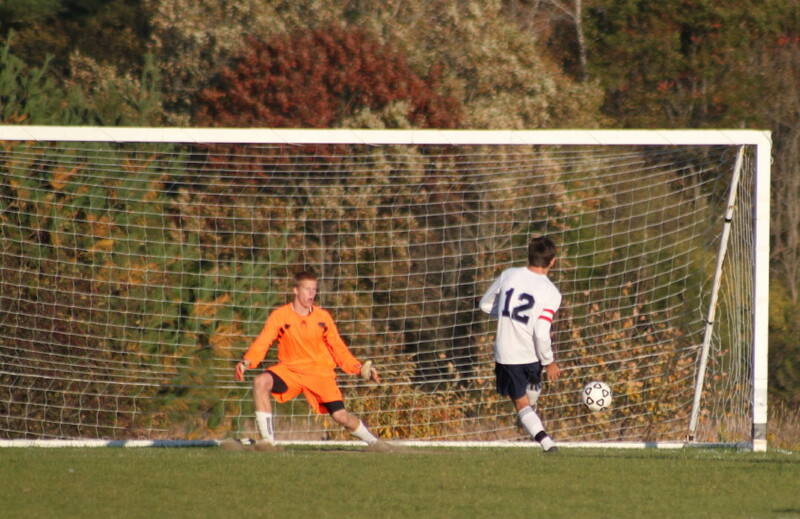 That actually gave me a better look at Demitre’s penalty kick (5:30 of the second half). 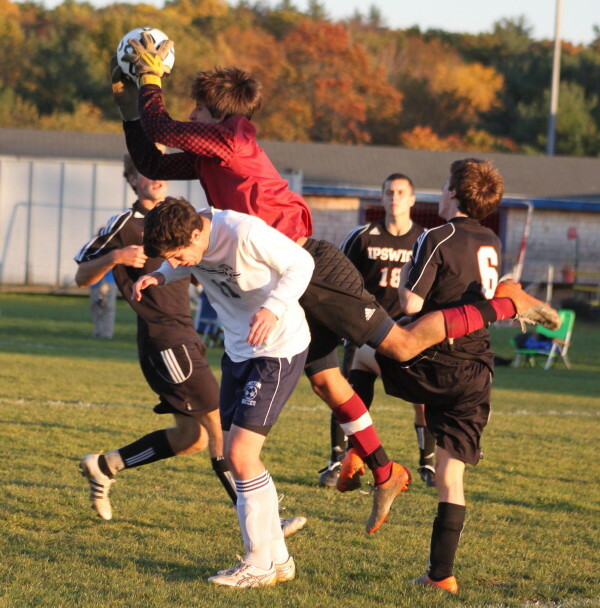 My picture shows Tiger goalie Erik Fyrer flinch right as Demitre hit’s the shot to Erik’s left. The next twenty-five minutes Ipswich had six shots by my count but had trouble getting a clean look as Triton defenders, particularly John Mills, cleared threatening balls away. The second goal (31:30 of the second half) was harder to see than the first from long distance. 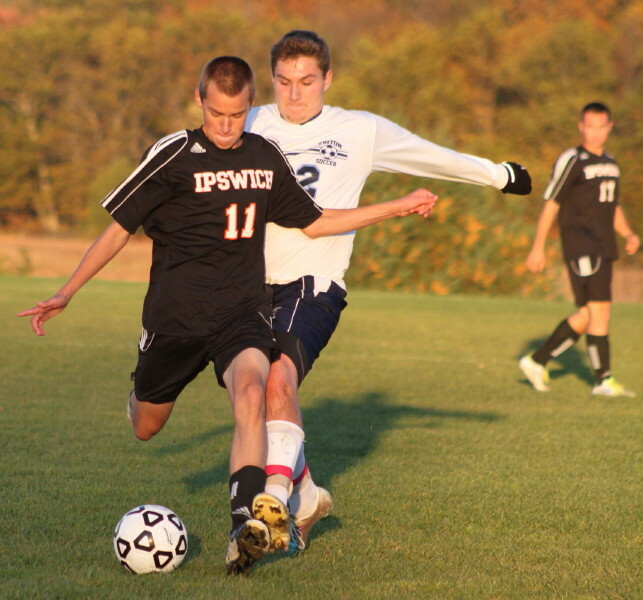 The ball appeared to be a high bouncer that the Ipswich defense was slow getting to. Jake Stelline took full advantage as Erik came out belatedly to try and get control. The next thing I knew the ball was in the Tiger net. Erik Fyrer (bright orange) leaps to catch a second half Triton shot. Erik Fyrer was run into by Mark Schwarz legally in the first half and was down on the ground for a while. Dalton Tzitzon made a nice leaping save in traffic late in the game. One player was given a card for wearing jewelry. A cross country meet between Pentucket and Triton was run during the soccer game. The result was that cross country spectators were standing along the goal line of the soccer game with their backs to the soccer game while it was going on. I couldn’t help but think that this had the makings of an accident waiting to happen. The foliage in the distance at Triton outdoor events this time of year is truly remarkable. The Creator has an eye for beauty! 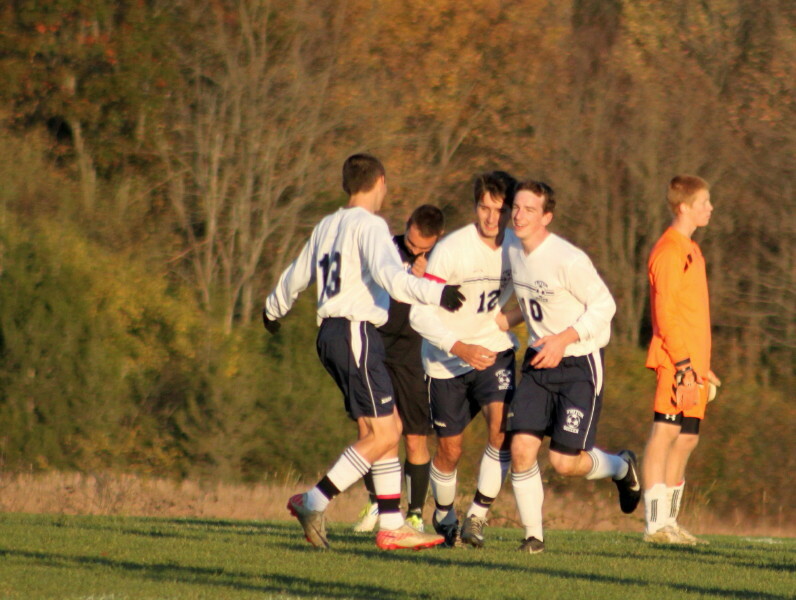 Triton’s last game will be hosting Pentucket at 3:45PM on October 27th (Thursday). 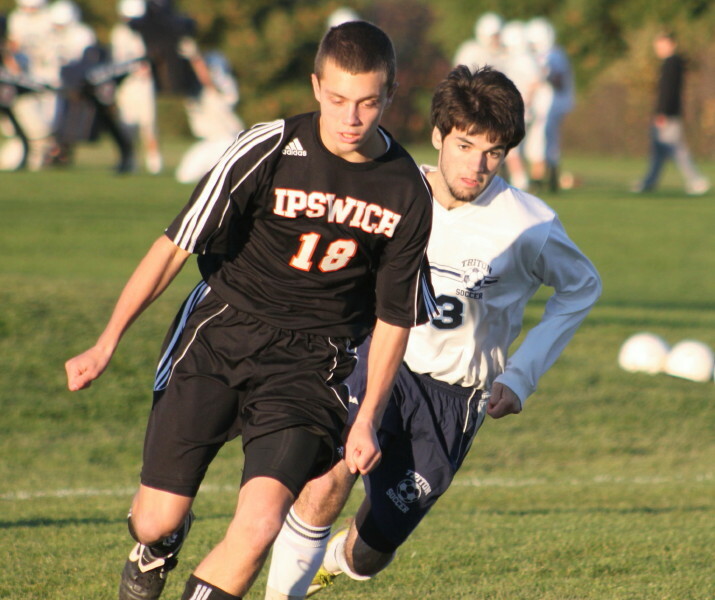 Ipswich will be at Hamilton-Wenham same day, same time. (I take my own pictures and collect my own stats. I own the mistakes.) Clicking on the pictures enlarges them.